US game sales total approximately $16 billion, with unit sales of digitally distributed titles now surpassing physical purchases, according to The NPD Group. Following similar trends in the music and movie industries, game buyer preferences are shifting away from packaged software to online distribution, a change driven in part by increasing consumer acceptance of virtual goods. As spend moves from packaged goods to higher margin digital sales, which gaming companies stand a better chance of winning out over others? Those who really “get” that digital distribution is not just an alternative format to boxed games, but a huge opportunity to expand the audience for games through new ownership and access options, according to Elastic Path’s latest research The State of PC Gaming 2011: The Shift from Packaged Goods to Digital Distribution. Download a free copy of the full research report. 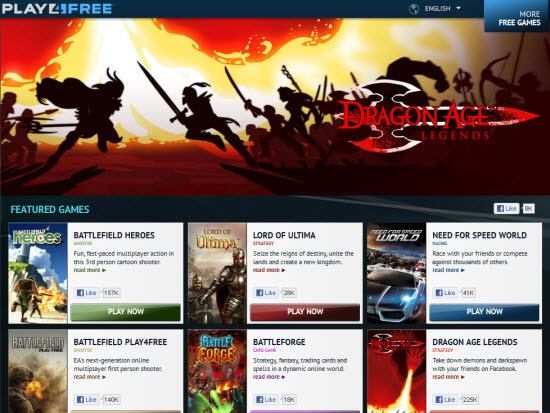 PC gaming has been dominated by straightforward perpetual license sales. However, most of the 505 US gamers surveyed were eager for new ways to own or access titles, particularly cost effective, flexible options that lower their upfront commitment to an individual title. No surprise there, given the fragile US economy. 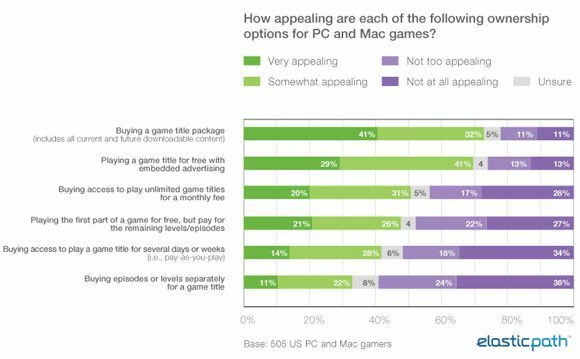 Looking at the graph below, almost three quarters of those surveyed liked the idea of title bundles that include future downloadable content (akin to an individual game subscription), while 70% of adults found free, ad-supported PC games appealing. Many others were interested in Netflix-style all-you-can-play subscriptions and short-term game “rentals”. 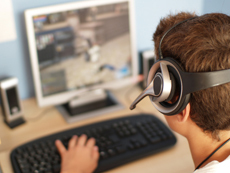 Although still uncommon in gaming, pay-as-you-go or rental models such as cloud-gaming service OnLive’s 3-day and 5-day access allow infrequent gamers to pay only for time spent playing. Freemium models remove the incentive to pirate by making downloads free-to-play and monetizing more easily controlled in-app items. One of the latest “play for free, pay for upgrades” titles, EA’s Battlefield Play4Free released earlier this year in the midst of a freemium boom that includes Facebook and mobile games. Freemium has been particularly successful in mobile gaming; over the first half of 2011, game revenue in the App Store shifted dramatically from premium to freemium with 65% of all revenue generated among the top 100 games now coming freemium games. Low-cost digital subscription services, such as the one announced earlier this month by games-by-mail company GameFly, can build audiences for niche titles while creating reliable revenue streams. Game quality and perceived value of the service will be crucial to success. Unlike in-store sales, digital distribution allows an unlimited number of variations of each title to be created and sold, expanding its potential audience. Examples could include multiplayer only, single player only, campaign-mode only, starter editions, certain levels or courses, and so on. Such forms of “customizable ownership” allow consumers to determine themselves how much of a commitment they wish to make to a title or franchise, and offer better value to those who just want to purchase a particular mode, style or level of play. Interested in more gaming content? Download a free copy of the full research report The State of PC Gaming 2011: The Shift from Packaged Goods to Digital Distribution. Alternatively, watch our on-demand webinar, Monetizing Digital Content – the Rocky Road Ahead, where we explore consumer attitudes towards paying for online content. As head of consumer research with Elastic Path’s Research and Strategy division, Amanda Dhalla helps global enterprises like Google better understand consumer behavior in order to optimize their digital offerings. Amanda’s research has been cited by CNN, Econsultancy, Smart Money, and Internet Retailer. A seasoned ecommerce professional with more than 14 years in the field, Amanda has hands-on experience marketing, merchandising and managing multimillion dollar online stores. Her areas of specialization range from market research, conversion optimization and analytics to traffic generation tactics such as social media, search engine optimization, and content marketing.